Team Phungo just got back from vacation so we are a bit busy with returning to work and recovering from the SABR conference in Chicago. Perhaps at some future time I will return to the rather interesting "no-hitter" tossed by Andy Hawkins. Following the 1991 Season an MLB Stats committee adopted a rule requiring a game to have at least 9 innings pitched to be considered a no-hitter. 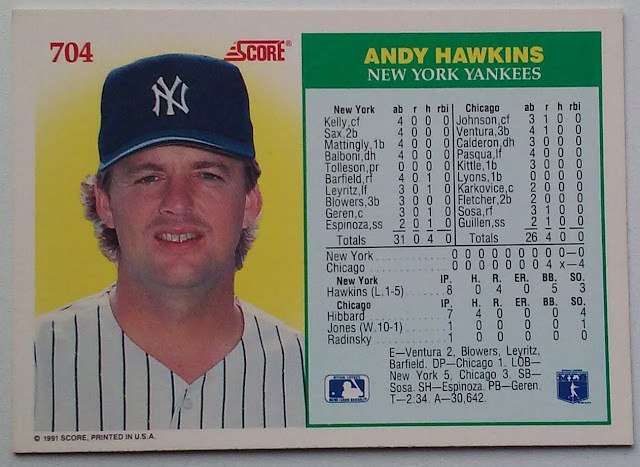 So Andy Hawkins No-Hitter in a loss, is now no longer considered a no-hitter. This is not the only 1990 Year of the No-Hitter game that the new ruling effected. In a few weeks we will get to the other 1990 game that has been rescinded. The White Sox are not the only team to score in a no-hitter. Baseball-Ref has a list here. 1990: Year of the No-Hitter - June 29th Fernadomania! 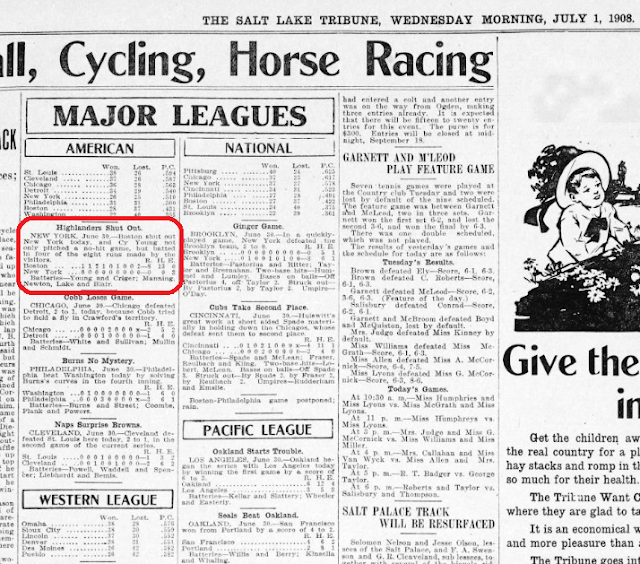 If 1990 was the year of the No-Hitter, June 29th of that year was the Day of the No-Hitter. 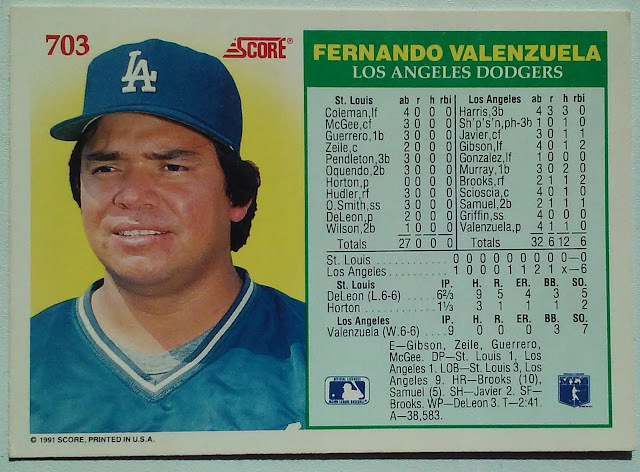 After Dave Stewart's East Coast No-Hitter, Fernando Valenzuela followed up with one for the fans in the Pacific Time Zone. He turned the trick in a 6-0 victory over the St Louis Cardinals. Fernando Valenzuela peaked early, He won Rookie of the Year and Cy Young Awards as well as a World Series ring all at the age of 20 in 1981. He made every all-star team between 1981 and 1986. In 1990 Fernando was only 29 but his best years were behind him. He was struggling through a mediocre season when he tossed his gem on June 29th. There were a couple of close calls in the No-Hitter which is featured here. With one out in the 9th Pedro Guerrero hit a grounder back at Valenzuela which the pitcher just got the tip of his glove on. It is hard to tell in the video, The Dodgers were playing for the double play, but had Valenzuela not tipped the ball it may have sped pass the two middle infielders. As it worked out the ball glanced off Valenzuela's glove and was fielded by second baseman Juan Samuel who started the game ending double play that was completed by future Hall of Famer Eddie Murray. Valenzueala pitched to three over the minimum - three walks and an error, one of the walks was erased on the game ending double play mentioned above. The obstacles in the Cardinals lineup included Hall of Famer Ozzie Smith (batting 8th!!! ), One time MVP and Batting Champ Willie McGee and the speedy Vince Coleman. McGee worked one of the three Cardinal walks, three of Valenzuela's seven strikeouts came against Coleman. The Dodgers defense included the aforementioned Eddie Murray and Juan Samuel as well as Future Angels Manager Mike Scioscia who made up the other half of the No-Hit Battery. One time Philies second baseman Juan Samuel hit one of two homers for the Dodgers - the other was by Hubie Brooks. It was the first of two no-hitters caught by Scioscia, the latter was authored by Kevin Gross who like Samuel debuted with the Phillies. Within the game box on the Score Card I like how they triple-apostrophe-d Mike Sharperson's name. In 2001 The Dodgers honored Fernando Valenzuela with one of the first three Bobbleheads ever given away at Dodgers Stadium. Unfortunately, the Dodgers lost the game 3-2 to the Rockies on a 9th inning RBI single by Alex Ochoa. The bobblehead shown above is part of the Baseball Hall of Fame's Viva Baseball exhibit which celebrates the Heritage of Latin American players. 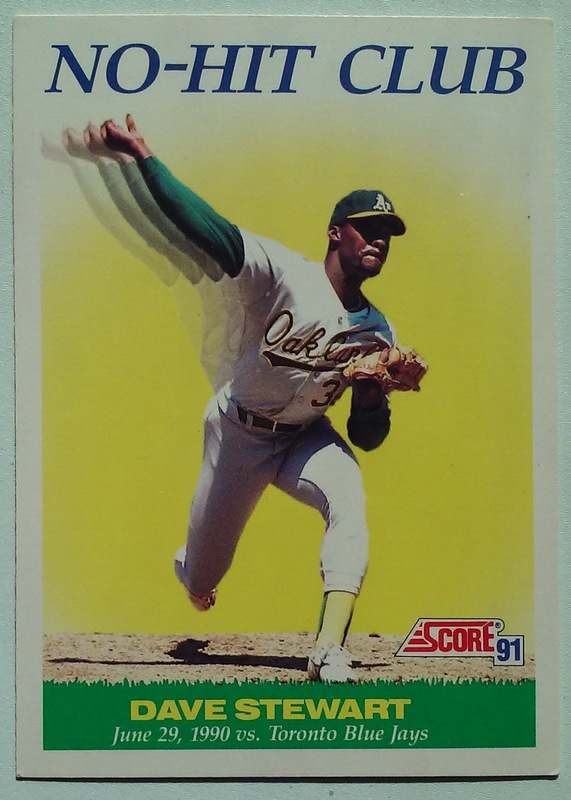 On May 9th 1986 the Phillies released Dave Stewart to make room for Ron Roenicke whom they purchased from the Oakland A's. A year later the Phillies released Roenicke and Dave Stewart led the AL in Wins en route to finishing 3rd in the AL Cy Young Voting. 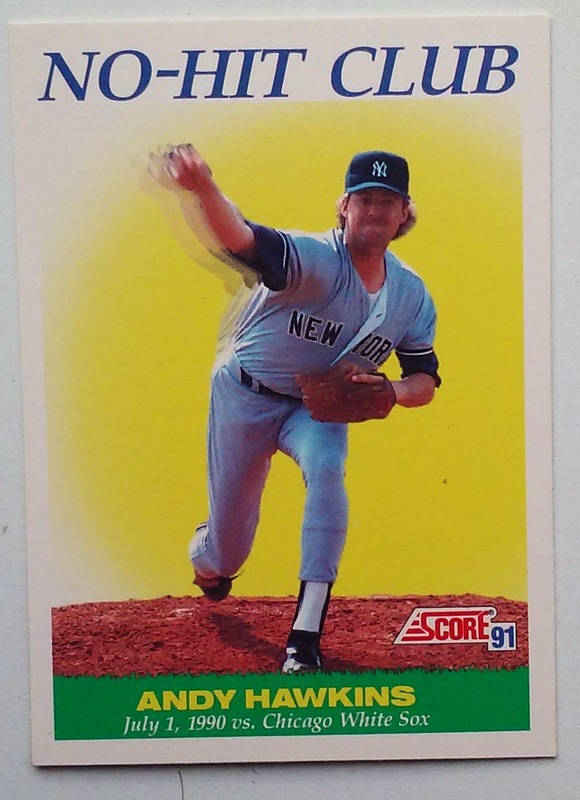 1990 was the fourth consecutive year that Stewart would finish in the Cy Young top four. He was coming off a World Series MVP award in 1989 and was near the top of his game. That was not good for the Toronto Blue Jays. Stewart was dominant, He struck out 12 and walked 3 pitching to two over the minimum - the extra runner (Junior Felix) was eliminated via caught stealing. Looking inside the box we find the 1990 Blue Jays to be a pretty good hitting squad, Fred McGriff would hit .300 that season and the young John Olerud would eventually win a batting title. Stewart's final three outs were Strike Outs of Manny Lee and Mookie Wilson and a Tony Fernandez Fly Out. Dave Stewart's battery-mate for the no-hitter was Terry Steinbach who doubled and tripled in the game. In 1999 as a member of the Twins Steinbach called a second no-hitter authored by another Phillies connected pitcher - Eric Milton. 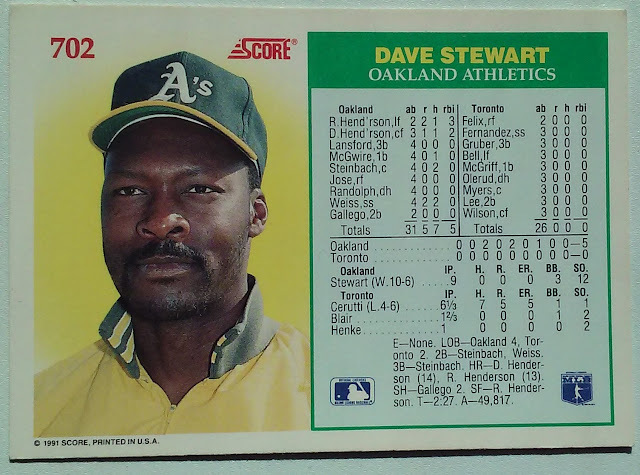 Among the folks playing defense for Stewart's no-hitter was future Hall of Famer Rickey Henderson. Rickey pitched in with a Homer, Sac Fly, and a Put Out in left. There are a couple of Father and Son/Daughter cards out there, this is one of my favorites. 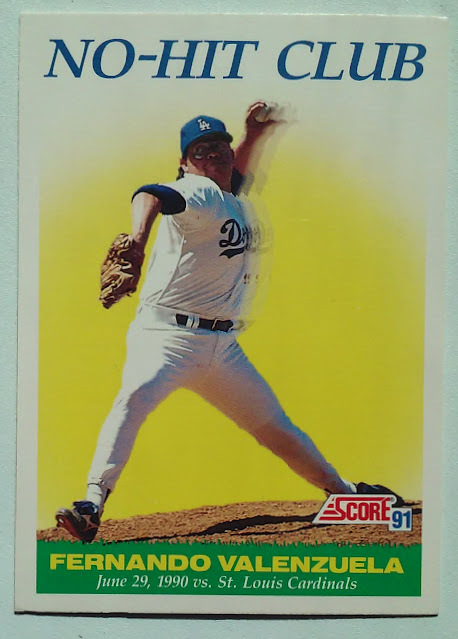 Understandably the card a favorite of Curt Schilling. Last month he posted this via his Twitter account. 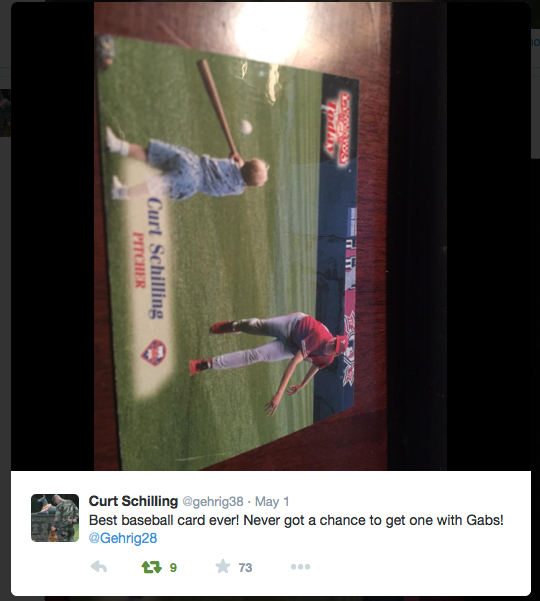 Curt is pitching to his eldest son Gehrig in the photo (the @Gehrig28 referred to in the Curt Schilling's tweet). This Past Friday Gehrig and his sister Gabby were featured in an SI.com article discussing bullying and internet bullying. The reverse of the Schilling card contains some comparisons to a few pitching legends. This is before the three World Championships and he is being held up to the standards of a Legend like Bob Gibson. 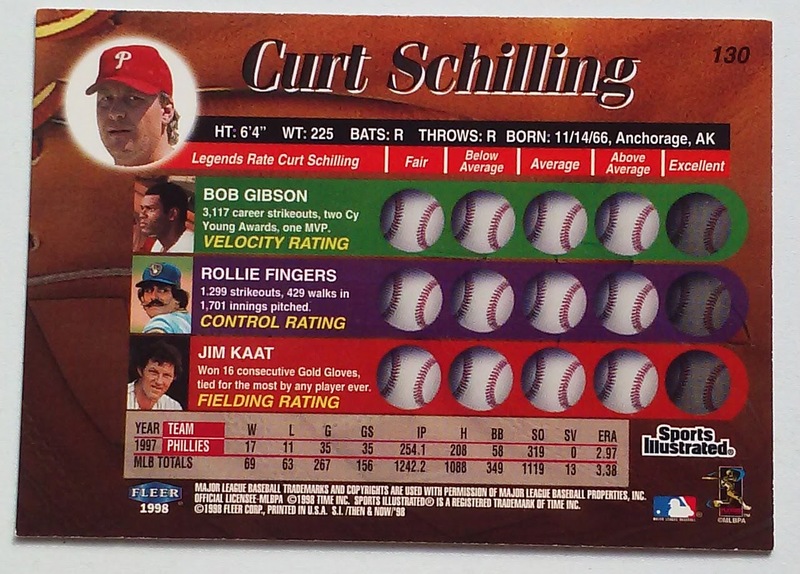 The presence of reliever Rollie Fingers in the graphic seems odd, however the walk rates for him and Schilling appear to be somewhat similar. I had really wanted to get to one game on each side of the Phillies Home/Home series with the Orioles this week, but Work, the Calendar and weather have conspired against me. Despite last nights 19-3 debacle I would have liked to have been there. I have been to 200+ games and I am not sure I have ever seen a position player pitch. Last night the Frenchy moment may have salvaged an otherwise brutal game. Unfortunately a glaring communication failure combined with a complete mishandling of the bullpen at the end of the game turned a laugher into a pretty sour evening. After a miserable debut a year ago Domingo Santana picked up his first major league hit today. The surprising Astros acquired Santana as part of the Hunter Pence trade in 2011.The lean years and deals for future prospects appear to be paying off for Houston. At the time of the trade Santana was such a low level prospect that it was hard to project if he was a major league talent. This season he was listed as the #71 prospect by MLB.com. This may only be a short callup, but hopefully Doming Santana will soon be in the majors to stay. I am a numbers guy and have had a slight obsession with Hero Numbers, lately I have also been thinking about the first card in each set. This ramped up a bit more this spring when Derek Jeter's appearance in the Pole Position prompted a large degree of discussion. 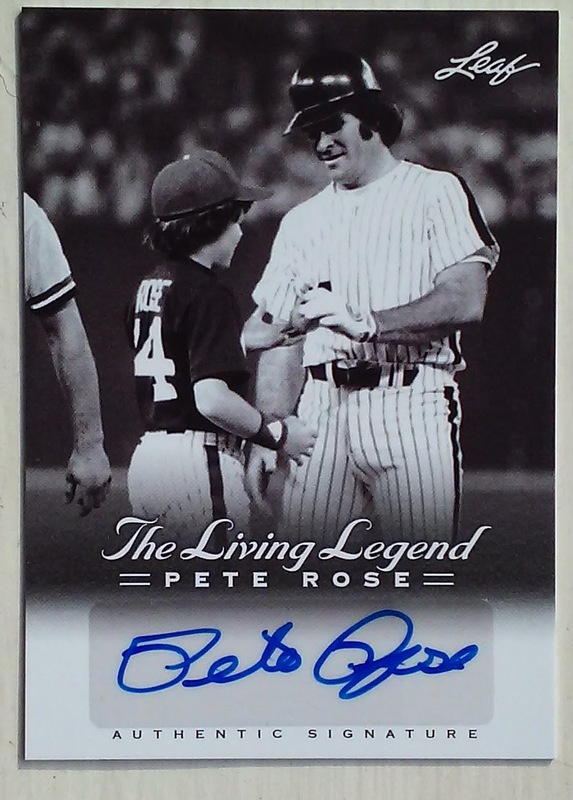 In a number of Topps Sets the first card is devoted to either a Highlight Card or a Record Breaker Card. If my history is correct we owe this to Hank Aaron who took the #1 Slot in 1975 with the a Record Breaker Card. The Previous year he also took the #1 with a special card but it wasn't technically part of a Record Breaker or Highlight set. 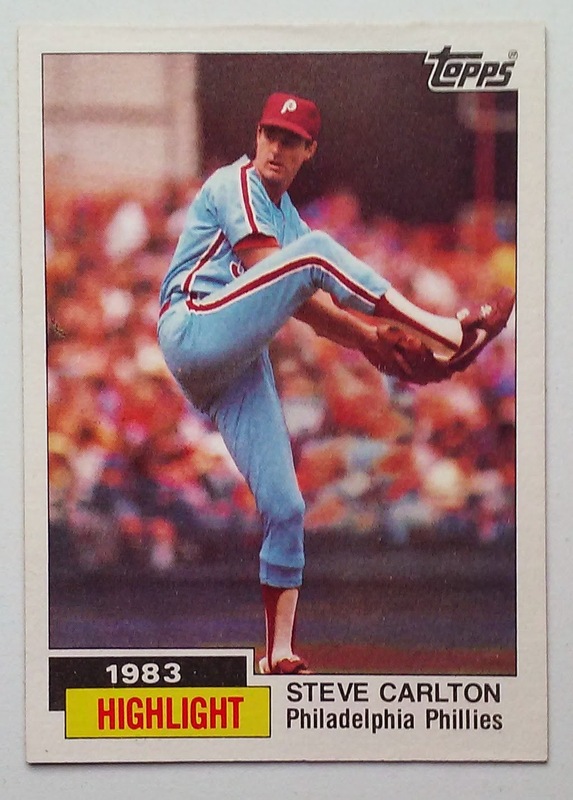 The 1984 Topps #1 Card honors two Steve Carlton milestones 1) Reaching 300 Wins 2) Setting the Strikeout Record. The Second accomplishment he essentially shared with Nolan Ryan for most of the 1983 before Nolan Ryan pulled away the following year. The backside is set in a psuedo-newspaper format with a Dateline in Philadelphia. The October 2nd date is the last day of the Phillies Regular Season, but it is also a Day that Carlton Didn't even play. 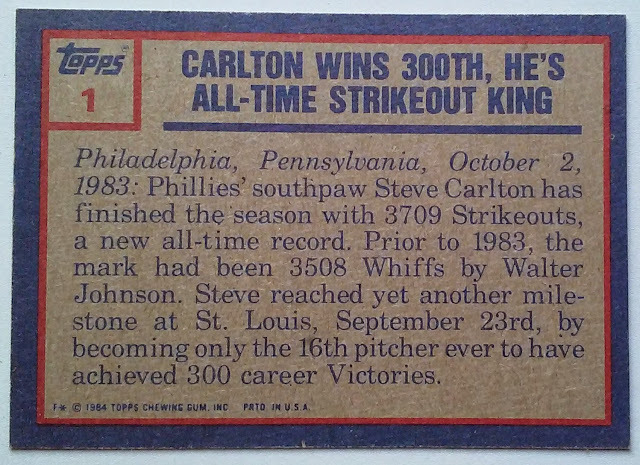 Carlton ended the season with 3709 Strikeouts the last of which was recorded on October 27, 1983. That game was preceded by Lefty's 300th Win in his previous start on September 23rd. Pretty strong HoF Resume for Mr Williams: 426 Home Runs, 2711 hits, 1961 Rookie of the Year, 1972 Batting Champ, and 3 Time League Total Base Leader. If it wouldn't be for Johnny Bench, Billy Williams would also have a pair of MVP awards on his mantle as well. The only omission is his modest postseason contributions. Like all the big time Cubs of the era (or almost any era) Williams got shut out of the World Series until he moved onto another team. Williams finally got to experience the playoffs in 1975 at the age of 37 as a member of the Oakland A's. Unfortunately his only playoff opportunity was brief as the A's were swept by the Boston Red Sox. Nice snap shot of Billy Williams number mid career. 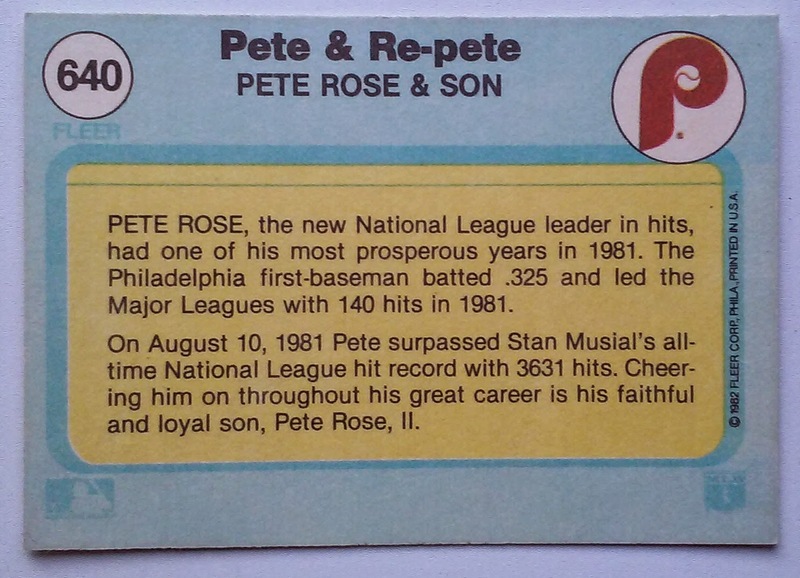 At 27 the man was established but still early in his career, He would hit 319 Homers after this card was produced. The cartoon is a nice nod to Williams Rookie of the Year award in 1961. 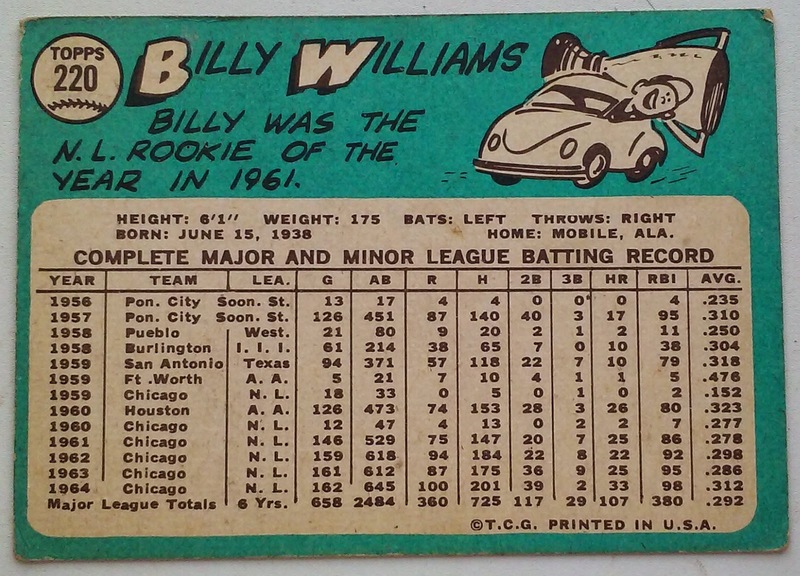 He appears to be driving a VW Beetle, likely as nice a car as a rookie could afford in 1961 when Billy Williams pulled in an estimated $9500. 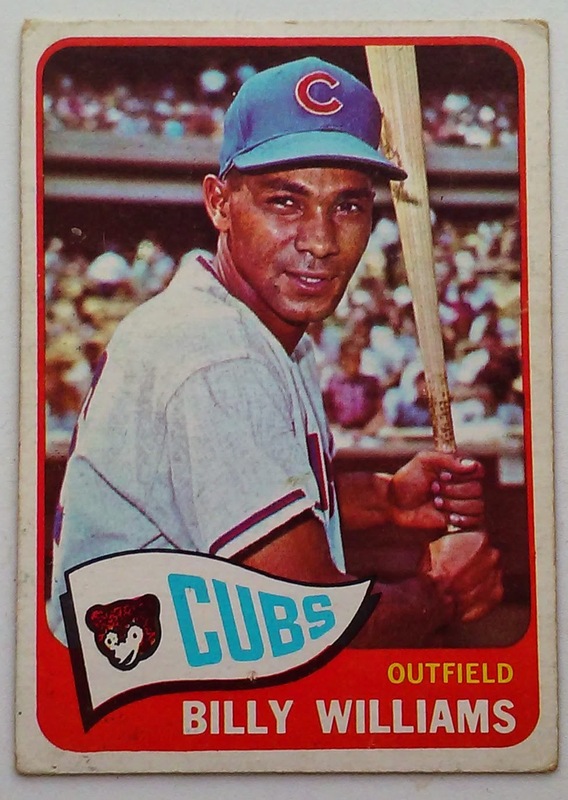 Post career Billy Williams returned to the Cubs as a coach but never got the chance to manage a club. In August 13th 1987 The Cubs retired Williams #26 just a few after his induction to the Hall of Fame. The Cubs drew 35,033 for the ceremony and the Fans got to see a W that day. The trade that sent from Billy Williams to Oakland was for a package of players that included Manny Trillo - The second baseman for the 1980 World Champion Phillies. 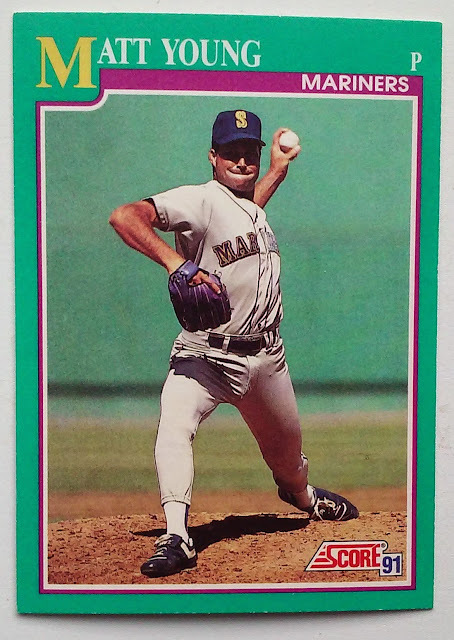 The idea of the Guarantee was conceived by the Mariners promotion department as the baseball public got caught up in the excitement of the the 1990 No-Hitter Frenzy - Mark Langston had pitched one on April 11th, The Mariners own Randy Johnson June 2nd, and Nolan Ryan earlier that week. 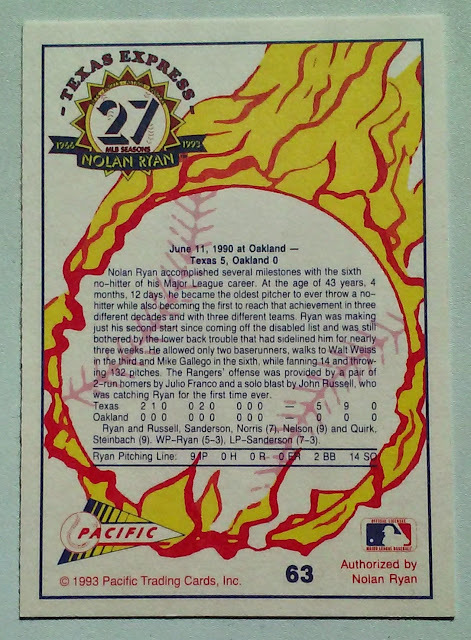 Another impetus for the M's was that they were hosting Nolan Ryan's first start after his June 11th No-Hitter. Had Ryan actually been able to redeem the Guaranteed No-Hitter for the Mariners he would have matched a feat only otherwise done by Johnny Vander Meer - Consecutive No-Hitters. For their part Seattle sent out journeyman pitcher Matt Young. The No-Hitter didn't get very far, Matt Young retired 4 batters before giving up a hit to John Russell. Harold Reynolds got the first hit off of Ryan in the bottom of the 3rd. Despite being the significantly less noteworthy pitcher Matt Young was the closest of the two to get a no-hitter. Young pitched the last of 5 career shutouts only allowing 3 hits (Russell, Ruben Sierra, and Rafael Palmiero) all singles. The promotion worked for the Ms, The 37,248 fans they drew to the Kingdome may seem pedestrian now, but it was the 4th best attendance number for the 1990 Mariners. It was also the most fans that got to see a Mariners win. Note: In a practice common in Minor League Games the Mariners Guaranteed No-Hitter Game came with the caveat that if there was not a no-hitter, fans would get a free ticked to a future game. The free ticket was a $4.50 General Admission ticket to the July 11th game versus the Angels. The Mariners won that game as well. It was a 2-1 victory by Erik Hanson over the aforementioned no-hit pitcher Mark Langston. It doesn't appear many fans took advantage of the no-hit redemption as 18,357 which was a tick below the teams 18,638 average for the season. 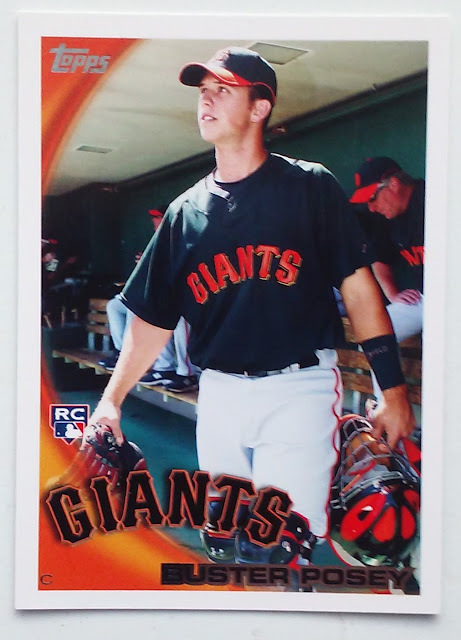 I like this card, it was issued the season after Ryan retired. 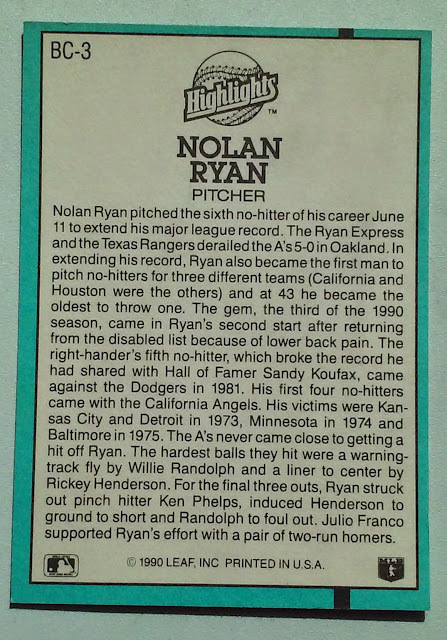 Topps noted his career accomplishments by placing Ryan on card #34, his uniform number. We are milking journeyman Greg Harris' Lo-Hitter for yet another posting just to show that prior to tossing his no-Hitter he really did pitch for the Phillies. Here we have the ubiquitous 1989 Topps. 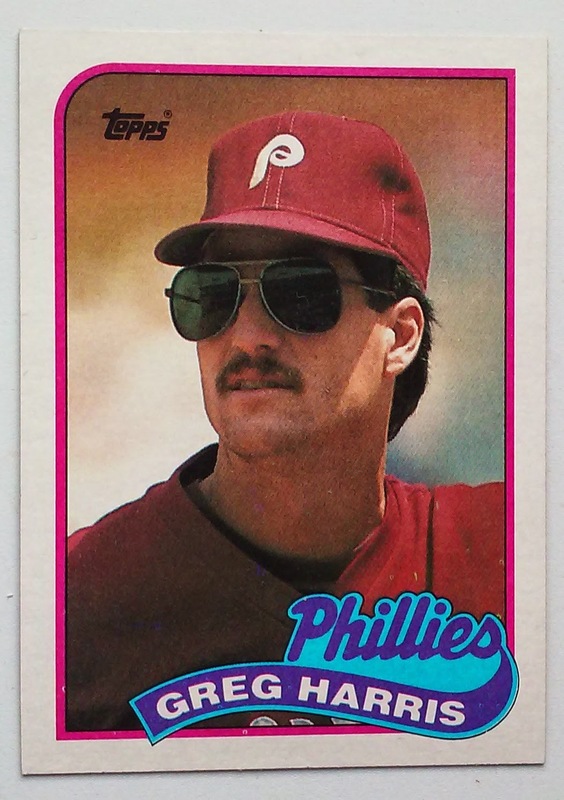 Harris is wearing the Aviator Shades similar in shape and size to the prescription lenses he has on the 1991 Score card we featured a few days back. Greg Harris pitched a season and a half for the Phils. In 1988 his 2.8 WAR ranked #2 on the team - that tells you a lot about the team which lost 96 games. Thanks for indulging us with Four postings on the Ryan Express today. During a season in which we are producing a series dedicated to the Year of the No-Hitter I felt that honoring the man who authored Seven of them was warranted. Our final card is one from a 1991 Donruss "Insert" set. The Photo here looks pretty similar to the one on the Topps Card in our previous post. Both cards have Nolan Ryan in a Rangers road grey as he would have been for the June 11 1990 game at Oakland, However I am not so sure that looks like the Colosseum. I am thinking that we are seeing Yankees stadium. 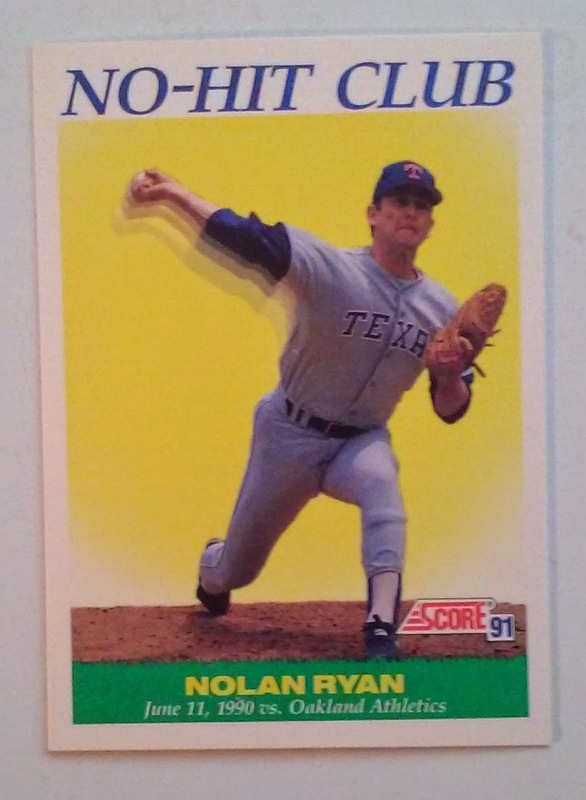 This concludes are look at cards specific to Nolan Ryan's 6th caree no-hitter. I like the Pacific Texas Exrpess card the best, Topps the least. I am sure there are other cards specific to this game, but for purposes of today's articles I wanted to stick to those issued contemporary to the event. 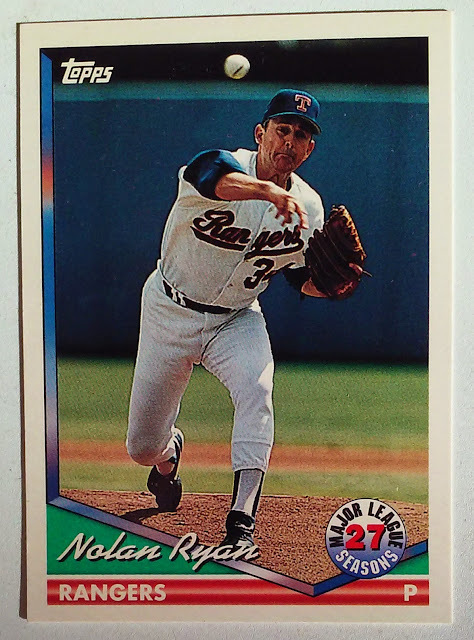 I have at least one other Nolan Ryan card for the coming days but by the end of the month we will need to move on to some other events in Year of the No-Hitter. This is the third of four postings on cards dedicated to Nolan Ryan's 6th No-Hitter. 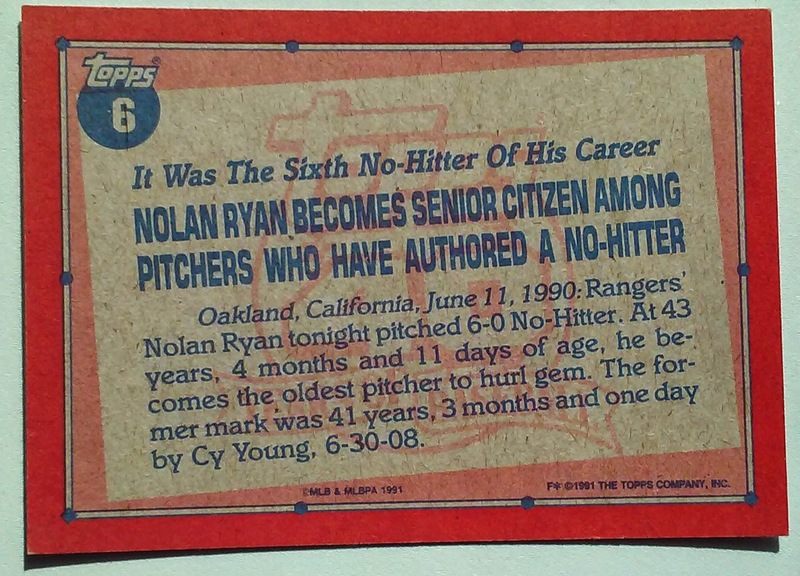 Topps chose to honor the fact that Ryan became the oldest pitcher to throw a No-Hitter, rather than to honor that fact that he had pitched a record 6th no-hitter - which was breaking his own record of five no-hitters. Of course less than a year later Ryan broke both of these records once again when he tossed his 7th No-Hitter at age 44. Interesting that a No-Htter in a Red Sox vs Yankees (Highlanders) game warranted a grand total of 1 line in the article. According to the B-R Bullpen the future Hall of Famer almost pitched a perfect game. The first batter Harry Niles walked but was subsequently erased on a caught stealing. Cy Young then retired the last 26 batters to complete the No-Hitter . There are at least Four Cards in the Phungo Collection dedicated to Nolan Ryan's 1990 No-Hitter against the Oakland A's. This 1993 Pacific Card is my favorite of the lot. This is a great baseball card. I would have elected to crop out the Jack in the Box/Michelin ads at the top, but otherwise this is pure beauty. We can see Ryan on the follow through and Willie Randolph mid swing for the final out. In an MLB Network interview Randolph mentioned hitting into the last out of the No-Hitter as one of his biggest career disappointments. Go to the 3:20 mark in the interview here. The fireball is part of the design on the flip side of the Texas Express series - A set dedicated exclusively to Nolan Ryan. 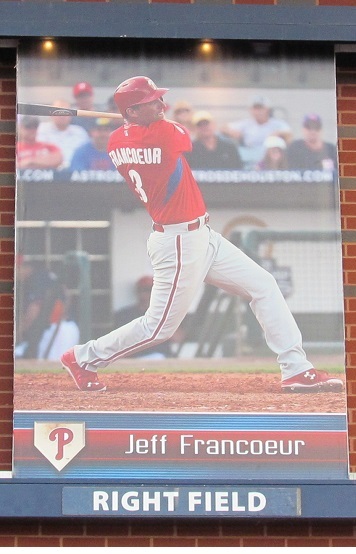 Good synopsis of the game including nods to former Phils Julio Franco and John Russell. 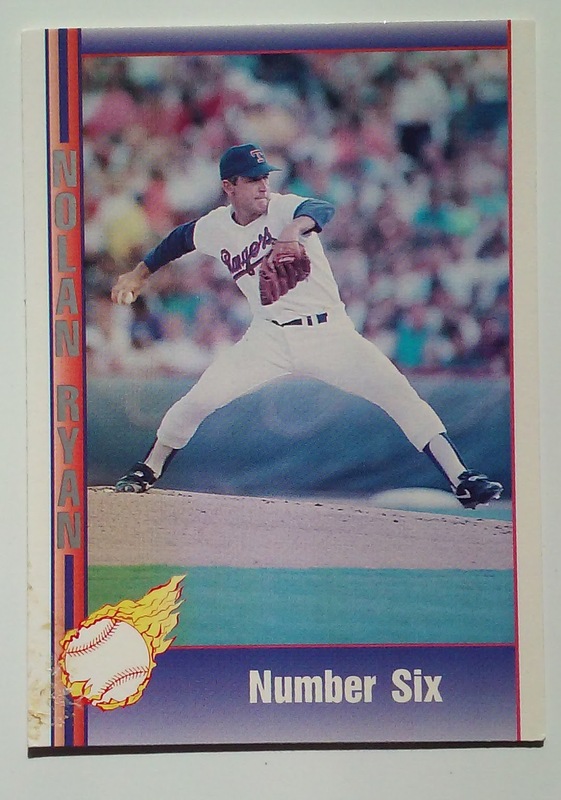 To Look at our master posting on Nolan Ryan's sixth no-hitter click here. As noted earlier in this series there are some great names and stories among the pitchers who were involved in the year of the No-Hitter, none of those pitchers was bigger than Nolan Ryan. 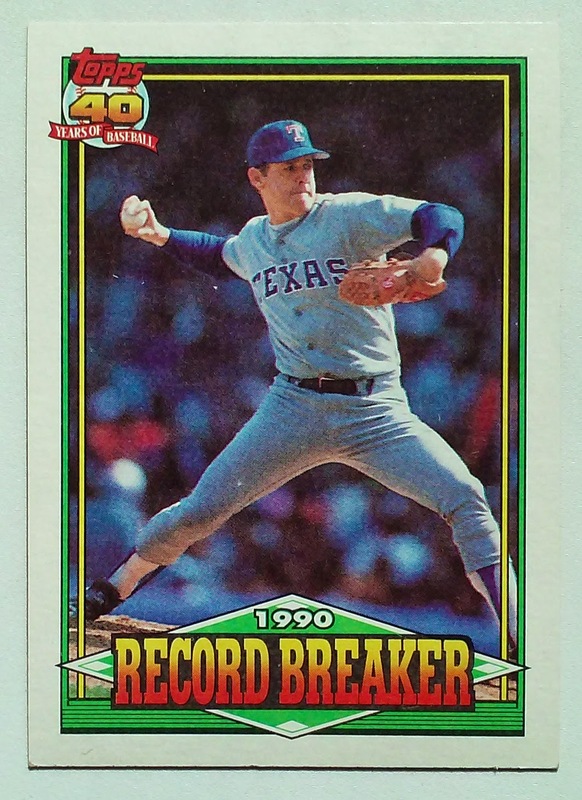 Nolan Ryan only had 7 spring training innings in prior to his Opening Day start which he had to leave despite having not given up a hit over 5 innings. By June 11th he had nine starts under his belt including a 1-hitter versus the White Sox on April 26th. Ryan now had built up plenty of arm strength to finish his record setting sixth career no-hitter. First off that is a scuff on the card, that is not bird droppings on Nolan's cap! For the second time in the series we have the Oakland A's making a guest appearance. Back in mid-April we discussed Brian Holman's near perfect game which was spoiled by a Ken Phelps Home Run. Ken Phelps made a 9th inning pinch hit appearance in this game as well. Nolan Ryan won this battle as he did something he did 5713 other times in his career. He Struck Out Phelps. That was the first out of the 9th which left Future Hall of Famer Rickey Henderson and Willie Randolph as the last two outs Ryan needed to complete his record extending 6th no-hitter. Henderson Grounded Out and Randolph Fouled out to right. There are three other Cards in the Phungo Collection dedicated to this game. We will be taking a closer look at each of the other cards tomorrow. For now we will just post the cards. 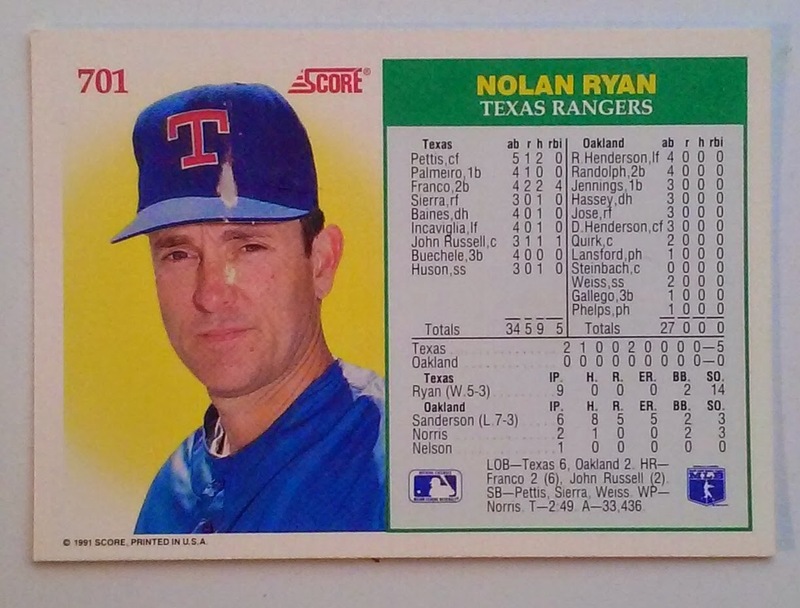 You cannot tell from the front but this card honors Nolan Ryan breaking his own record of five no-hitters. Added this card to the listing in November of 2015. Found it in a card show dime box. 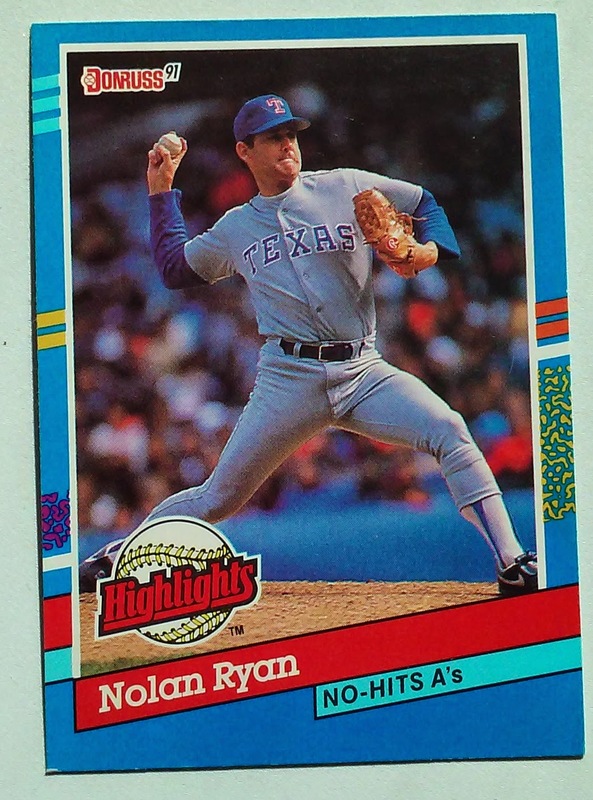 The name most associated with No-Hitter is likely Nolan Ryan, to recognize this we will be dedicating several postings to this no-hitter and the Ryan Express over the next few days. Below is an Index to these No-Hitter related Postings - a couple related to the cards above. 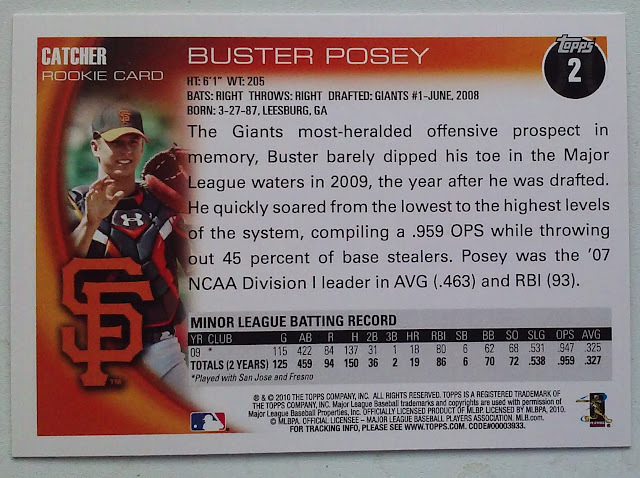 I don't think I have a Chris Heston card, Rather than digging around looking for one of his cards we are going to post one of Buster Posey who joined a pretty elite group himself last night. Posey became the 16th catcher to work 3 no-hitters. The all time record is four held by Jason Varitek. The Phillies are facing the Reds in Cincinnati which gives us the perfect opportunity to show off the Pete Rose auto we picked up via a 2012 Living Legends Blaster. The signature itself is a little shaky but I do like the photo. I don't know what the break down of images for this set are, but it is nice that we got one with Rose wearing a Phillies Uniform. Leaf had to airbrush out some of my favorite details so I dug up this version of the shot which I found at the now dormant Fielder's Choice Blog. 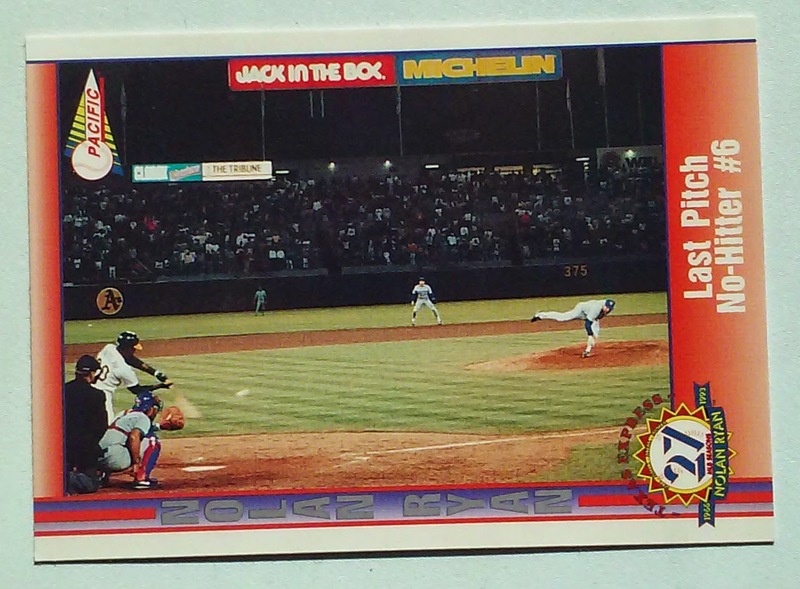 The phot on the above Fleer card was taken by Bob Bartosz. For a GREAT interview regarding Bartosz career as a baseball photographer check out Baseball Cards Come to Life. Back in 1982 Pete Rose was not yet the all-time hit king, but as noted on the card in 1981 he passed Stan Musial as the NL career Hits Hits Leader. 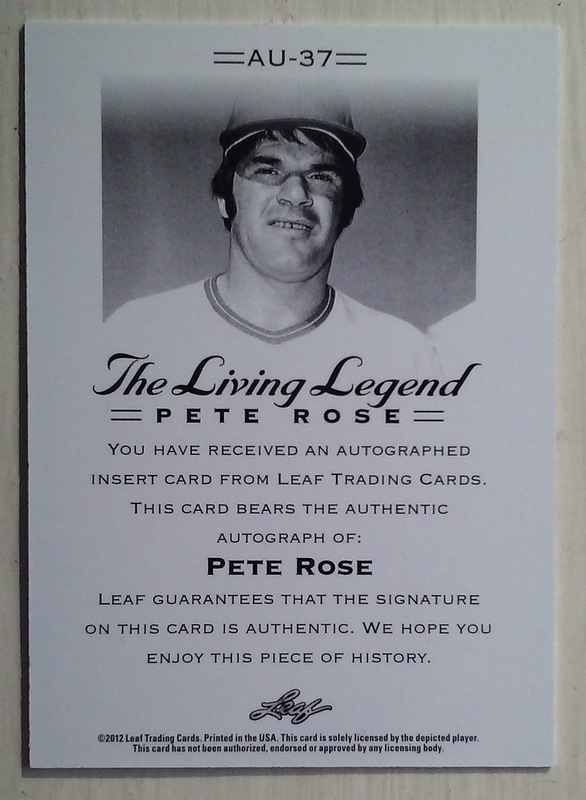 And just to wrap up we present the flip side of the Pete Rose Auto which limits itself to your typical COA verbiage. 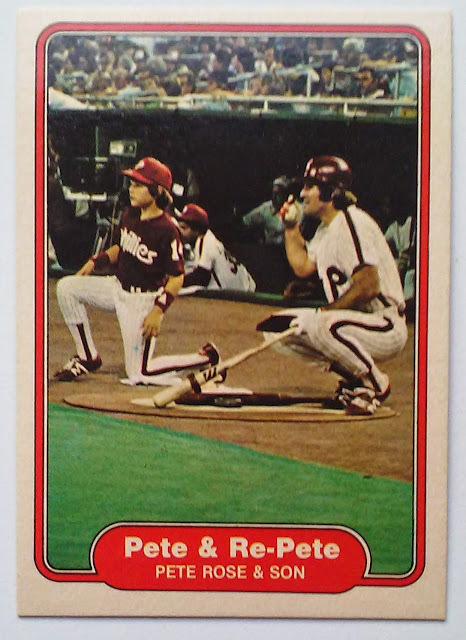 I know Pete ain't in the Hall of Fame. I am not going to get into that discussion here, but I am going to add him to our HoF Index as an honored star of the game. We have a sort of Phillies related post this AM. 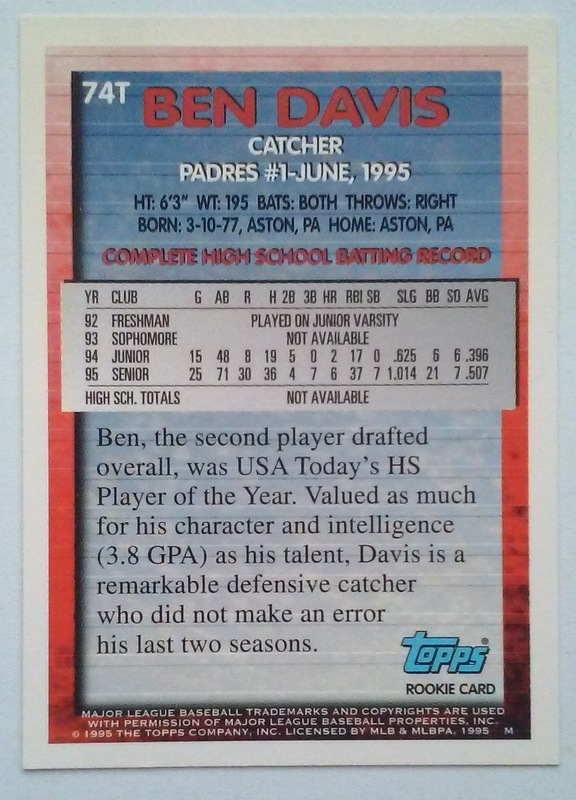 20 years ago this month Ben Davis out of nearby Malvern Prep HS was drafted 2nd overall by the San Diego Padres. Davis' Playing career is really not #2 overall pick worthy. He stuck in the Majors for seven seasons half of which were with the Padres. His best year was 2001 when he led NL catchers in games with 135 with a career High 11 Homers and 57 RBIs. 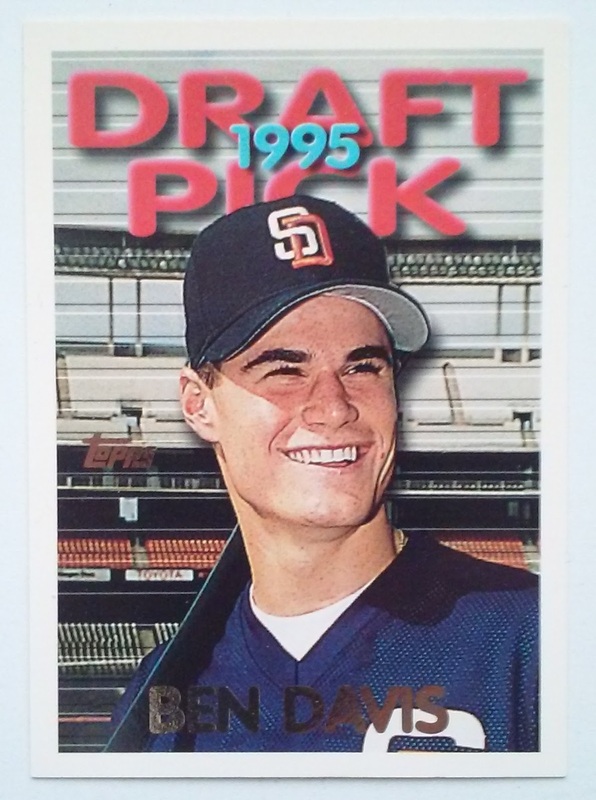 Ben Davis ended his career with a 2.7 WAR placing him 10th among 1st round draftees for 1995. Among the players the Padres passed on to get Ben Davis were Todd Helton (61.2 WAR), Kerry Wood (27.7), and Roy Halladay (64.6). The player drafted in front of Davis was Darin Erstad who compiled a rather surprising 32.3 career WAR. The Phillies never had a chance at Davis and missed on both of their 1995 1st round picks Reggie Taylor (14th, -0.5 WAR) and Dave Coggin (30th, +0.3). The Phillies did score a modest victory with Marlon Anderson in the 2nd round, 42nd Pick 7.2 WAR. Today Ben does Color Commentary on Phillies TV Broadcasts. He does a good job and I am happy to have a catcher's perspective in the booth. This week the MLB will be holding their annual amateur draft. 2015 marks the 50th anniversary of the event which was first held in 1965. With the Phillies in Cincinnati to face the Reds it is an apt time for us to discuss the best hitter taken in the initial MLB draft. 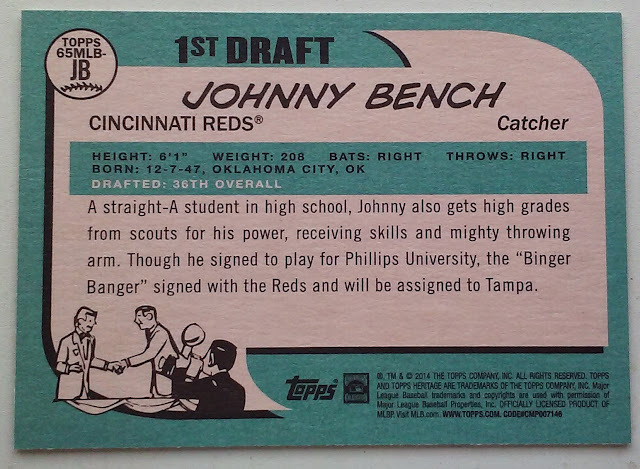 With their 2nd pick (36th overall) the Cincinnati Reds took Catcher Johnny Bench from Oklahoma City OK. The Phillies most successful selection from the 65 draft was Larry Hisle (24.9 WAR - 2nd round, 38th overall). The club failed to sign their first pick Mike Adamson (18th overall) but that is a subject best saved for another posting. 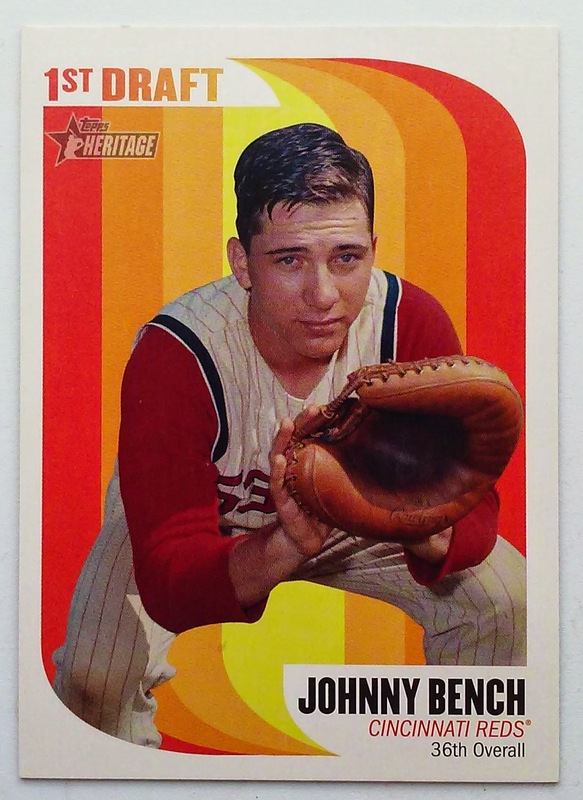 The 2014 Heritage 1st Draft insert set is a bit peculiar. There are only four cards which fall 1 in every 12 packs - the entire set can be built from 2 hobby boxes. 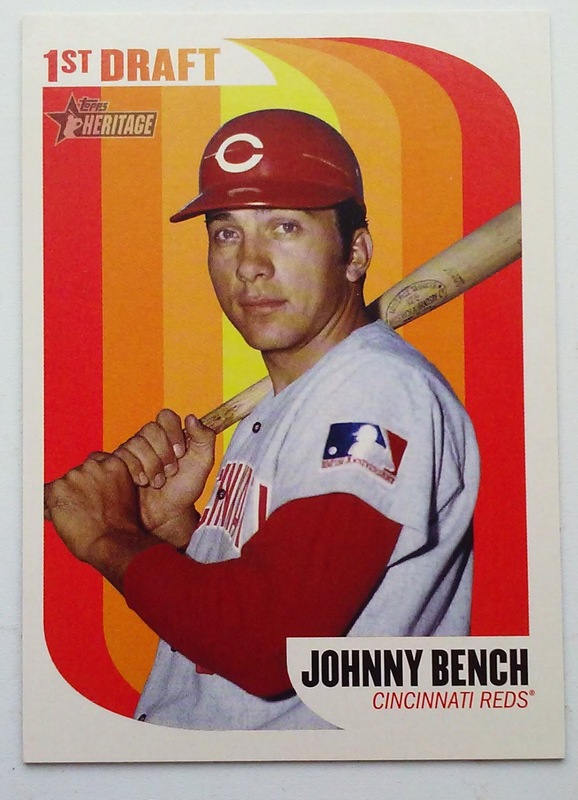 The set only has three subjects because Johnny Bench appears on two cards. The other two players are Ryan and Nettles. Just short of a year ago the Wilmington Blue Rocks hosted the California vs Carolina League All-Star game. The two biggest stars in the game may have both played the same position. 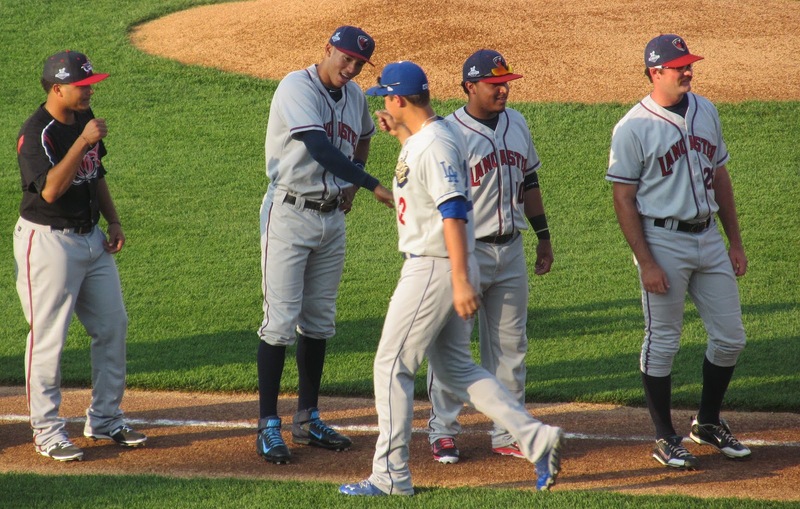 Shortstops Carlos Correa and Corey Seager were both on the California squad. The photo above was taken during the game intros. The shot is definitely one of the my favorites in the Phungo Collection. 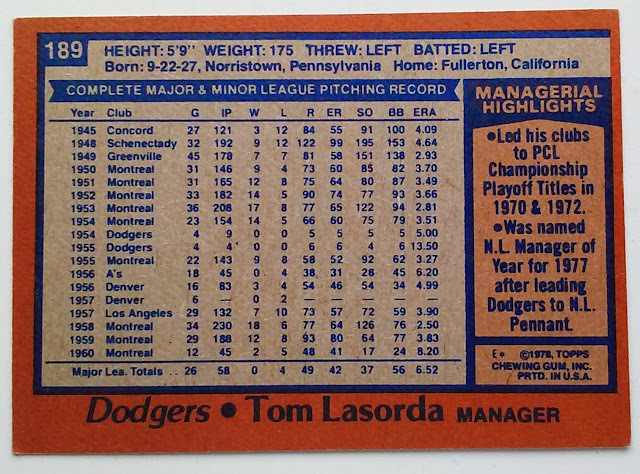 To me he has always been Tommy Lasorda, but the only Topps card that lists him as "Tommy" is his 1954 RC. 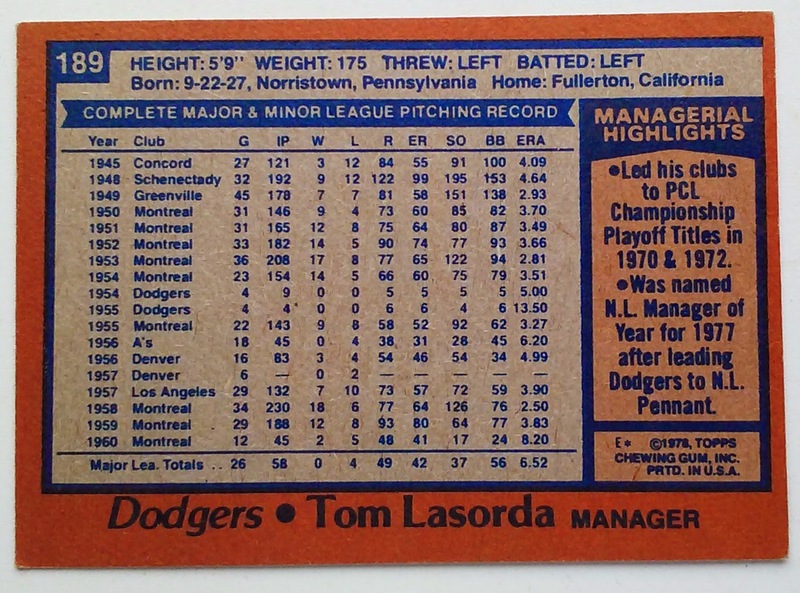 The eleven Lasorda Manager cards in the Baseball Simulator Topps DB all list the Hall of Fame Manager as "Tom"
Lasorda was elected into the Hall of Fame as a manager by the Veteran's Committee in 1997. His HoF Credentials include 1599 career victories all at the helm of the Dodgers. The pinnacle of those Wins were World Series Championships in 1981 and 1988. During his 18 full seasons the Dodgers won seven division titles and four NL Pennants. In addition to those season Lasorda also at the Dodgers leading the NL West in 1994 prior to the seasons work stoppage. His Division wins in 1983 and 1988 won him the Manager of the Year award, an honor he received votes for six times during his career. 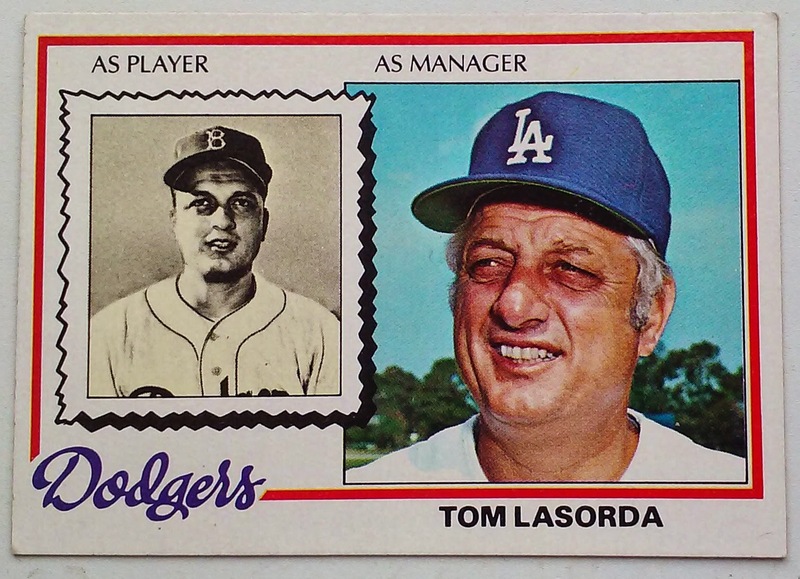 I don't believe Topps will ever release a better looking manager card than 1978T. This is a subset I would like to cover at some point. The recent/archive photo combo is a terrific take on the manager card. 1978 was probably the last moment you could pair a Black & White photo with a color one on a trading card. 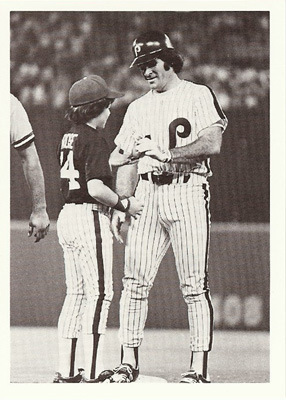 Every team should have a Baseball Ambassador, the Phillies have a few: Mike Schmidt, Dallas Green, Gary Matthews, and Greg Luzinski. Tommy Lasorda at age 87 is less visible than he once was but at one time he fulfilled the ambassador role not just for the Dodgers but for all of Baseball. Do scandals really ruin the great sports moments? I have pondered this about Barry Bonds 73 Homers. I remember the weekend Bonds broke Mark McGwire's record and went on to hit a couple of more homers. I saw the Record Breaker in a crowded bar with an excited crowd. There were cheers and toasts. It was like we had broken the record. But time changes things and we never really got to enjoy Bonds breaking Hank Aaron's record. The movement in time has now also changed how we perceive Bonds' 73 and McGwire's 70. But does that really take that moment away from us? I sincerely hope that scandal doesn't rob us of the first triple crown winner in a generation. I had a great time watching the race yesterday. Once again I found myself in a busy restaurant on beautiful day with a alcohol fueled crowd, we wanted to see something great happened and it did. Things are rarely perfect in life but when it happens it is pretty awesome. Cograts to American Pharoah and his team. 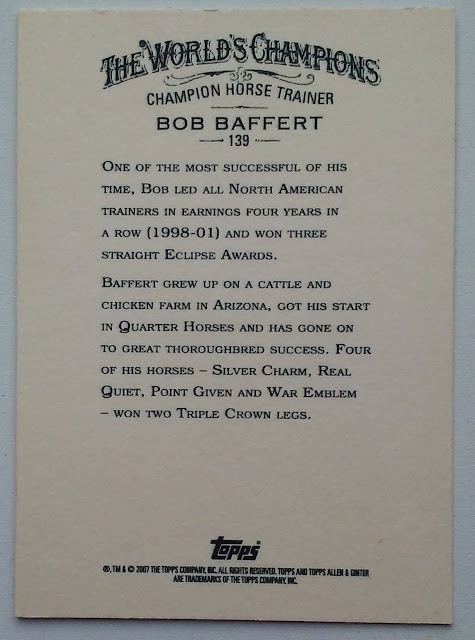 One of the folks involved in the horses success is Trainer Bob Baffert. Topps made Baffert part of their 2nd edition of A&G in 2007. 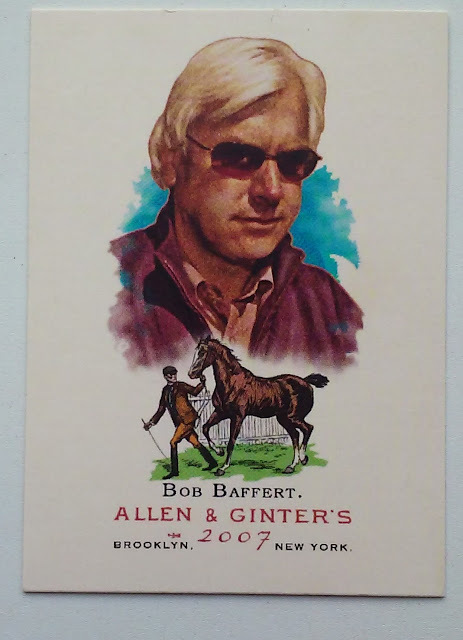 Baffert has a distinct look that is captured pretty well on the card, nice touch with the inset picture of the horse and trainer. Nice Synopsis of Baffert's career including his 4 previous near misses. Greg Harris did not join the Red Sox rotation until the teams 17th game on April 28th. 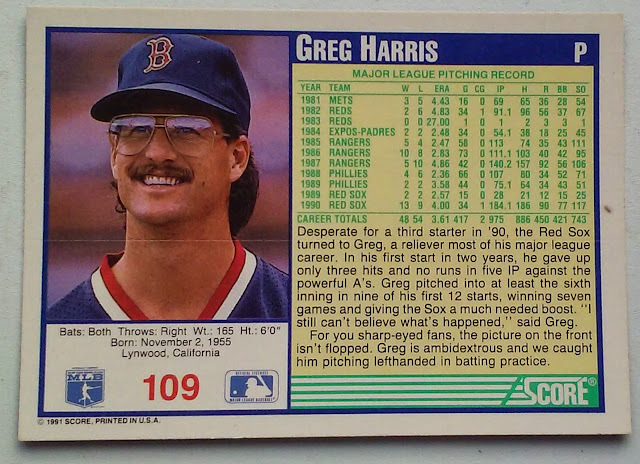 He was pretty much the definition of a SwingMan, but given the opportunity to start for a very good 1990 Red Sox team, Harris made the most of his opportunities. On June 7th Harris had his best start of the year, He and Closer Jeff Reardon combined to throw a 1-hitter as the Red Sox shutout the Yankees 3-0 . Notice this is a Lo-Hitter as opposed to a Near-Hitter. The difference being that in this Game Greg Harris gave up a fifth inning single, while in a Near-Hitter (see Brian Holman or John Smoltz) The No-Hitter stays in tact deep into the game. I would say at least into the 7th is a good yardstick of went to start Near-Hitter talk. 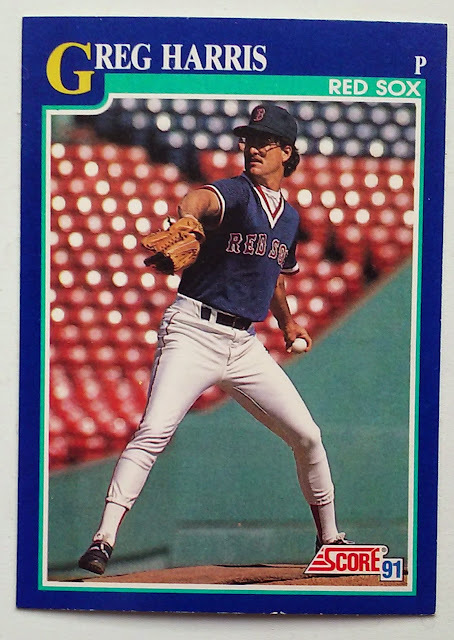 The batter that foiled Greg Harris' meeting with infamy was Yankee outfielder Jesse Barfield - and once again we will bring up how small a world baseball is and let you know that Barfield will play a role in a future Year of the No-Hitter posting. Barfield was the only Yankee to reach base as Harris/Reardon pitched to one over the minimum. The final inning was uneventful although there was a Hall of Famer that batted that inning, although it was a football Hall of Famer - Deion Sanders. This is a GREAT Card. Notice in the box with Greg Haris' Demographic info we find that he is right handed. Now look at the action shot on the A-side. Harris is throwing Lefty. Check the end paragraph on the back of the card. The Ambidextrous Harris is tossing BP in the photo and he is throwing Lefty, I would assume he is a bit less dominant from that side. We have some fortuitous timing here as this earlier this weekend The A's called up switch-pitcher Pat Venditte. He has a special Ambidextrous glove that allows him to pitch from different sides in the same inning, can't tell from the above photo, but it appears that Harris is using a LH glove on his right hand.